Eric was born in Toronto in 1909 to parents who had earlier emigrated from England. His father was an advertising consultant but young Eric showed more of an interest and aptitude for mechanical things. As a teenager he attended a technical college and helped a neighbour with his car repair business. A friend of the family loaned Eric an old belt-driven Royal Enfield motorcycle which he rode, dismantled and reassembled a number of times. He became an apprentice in electrical and mechanical engineering, combining a day job in the factory with school at night. Having set his sights on a new Indian motorcycle he had to figure out how to pay for it. Part of his savings scheme involved giving up entertainment as well as dropping his girlfriend of the time because transit fares to visit her were costing him a dollar a time. The week after his 18th birthday he delivered the $75 down payment and the Indian was his. The dealer mentioned an upcoming half-mile dirt track in Newmarket, Ont., so Eric rode his new bike to the track, stripped it down and won the novice race. “From then on I rode whenever I could in scrambles, hillclimbs, road races, speed and reliability trials,” he later wrote. “ A fair share of the honours came my way. 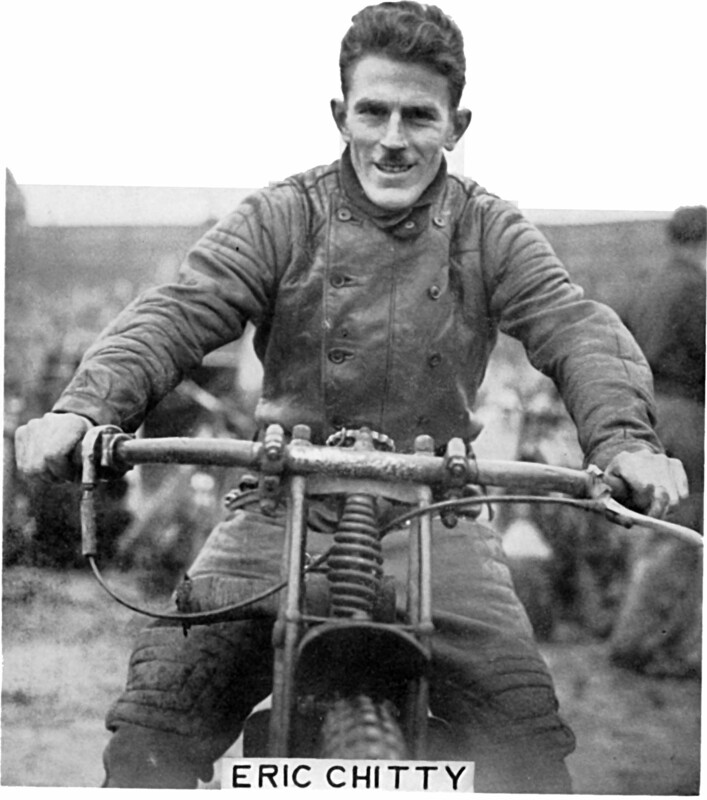 In 1929 I traded in the Indian for a new 350 cc AJS, an exchange which produced fine results.” Those results were numerous but came at a price; in a half-mile at Exhibition Stadium in downtown Toronto another rider hit his front wheel hard enough to knock it out of the fork legs, which then dropped to the ground and catapulted Eric head-first into a four-inch wooden post which he shattered into splinters. He was young, strong and had tremendous endurance. For races in Montreal and Quebec City Eric would leave Toronto after work on a Friday with his bike loaded with tools and camping gear. At the track he would set up camp, strip the bike for racing, reassemble it for the return trip and be back in Toronto barely in time to clock in Monday morning. Describing the races organized at the Forks of the Credit by the British Empire Motor Club he wrote: “My best 1929 effort was in the 24 hour endurance run at Belfountain, Ont. Over a 16.5 mile rough circuit, which included only one mile of paving or real road, I covered 495 miles in 18 hours 50 minutes riding time.” This was on a bike with no rear suspension and little at the front, as well as the questionable lighting system of the time. 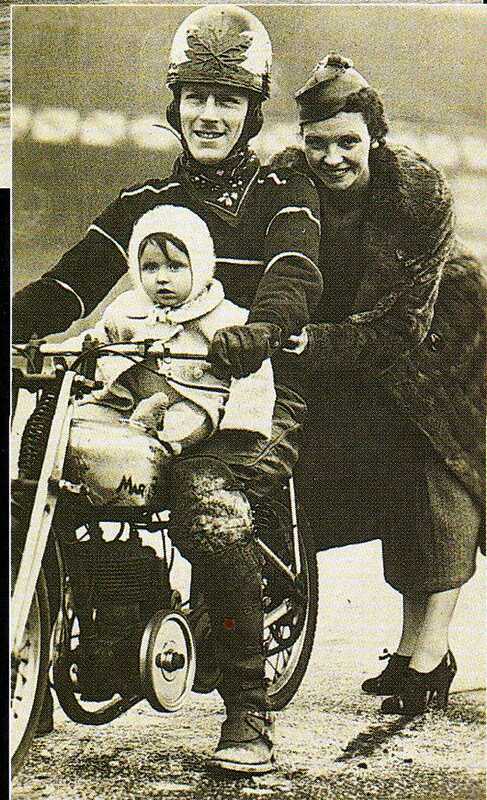 In 1930 Eric met his future wife Eugenie at a club scramble and persuaded her to become passenger in the Rudge he rode that year. This caused a stir at the next event, a speed hillclimb, where they were rewarded with first place at 75 mph. Eric became a riding mechanic and spare driver with famous adventurer Graham Oates when they set several world records in speed boats. In his memoirs Eric wrote that he’d suffered a nervous breakdown in late 1930 and been ordered to take it easy for the next 12 months. 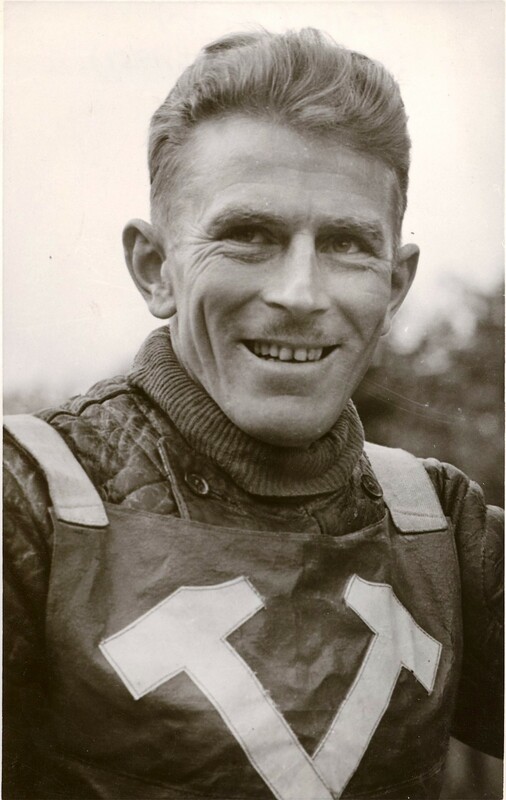 Still, it was little surprise in 1931 when speedway or short track racing was introduced to Canada that Eric was on the quarter-mile track at the old Ulster Stadium in east Toronto, where he shared the honours with Jim Ferguson. The Depression made life tough for Eric along with everyone else, and he started travelling far afield into the U.S. to try earning a living. Crowds were small and expenses ate up most of his winnings. 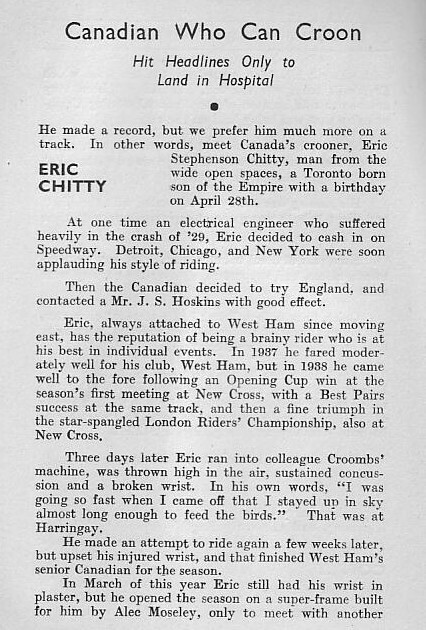 Eric had a chance meeting in Toronto in 1934 with Johnnie Hoskins, the transplanted New Zealander who is generally considered to be the founder of speedway racing in Australia and then England. A talent spotter and born promoter, Hoskins offered Eric a contract to race in England, but it seemed too good to be true. After another year of struggling to get by he sent a telegram to Hoskins asking whether the offer still stood and was immediately rewarded with a one-way fare to England. Eric’s family came up with the fare for his wife and their infant daughter and the three were on their way. 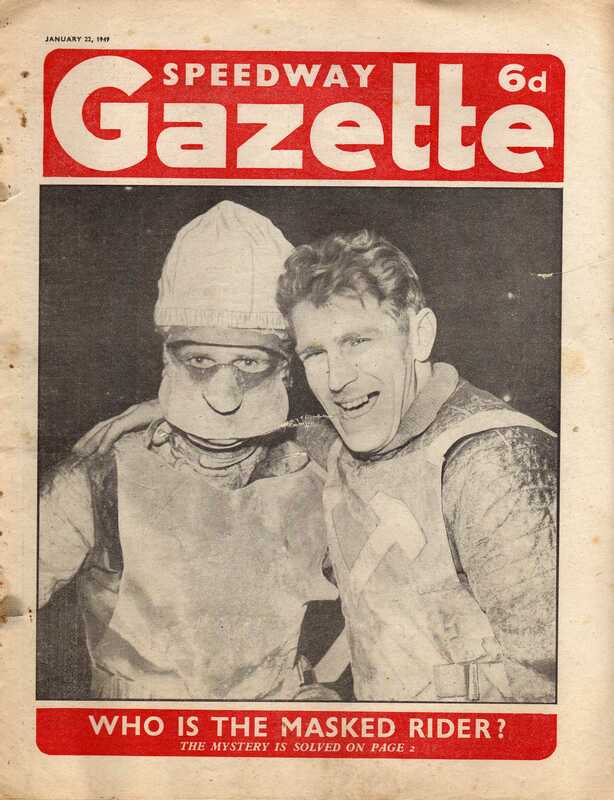 Eric Chitty became a top performer and raced with a number of English speedway teams, most notably the Hammers from West Ham, near London, where Hoskins was the promoter in residence. The reality of racing week after week was harsh but Eric rapidly expanded both his riding skills and his singing voice. He made a number of recordings as a crooner and would occasionally entertain the speedway crowds with what he called “a ditty from Chitty.” During the Second World War he worked in an aircraft factory and still raced as often as conditions allowed. 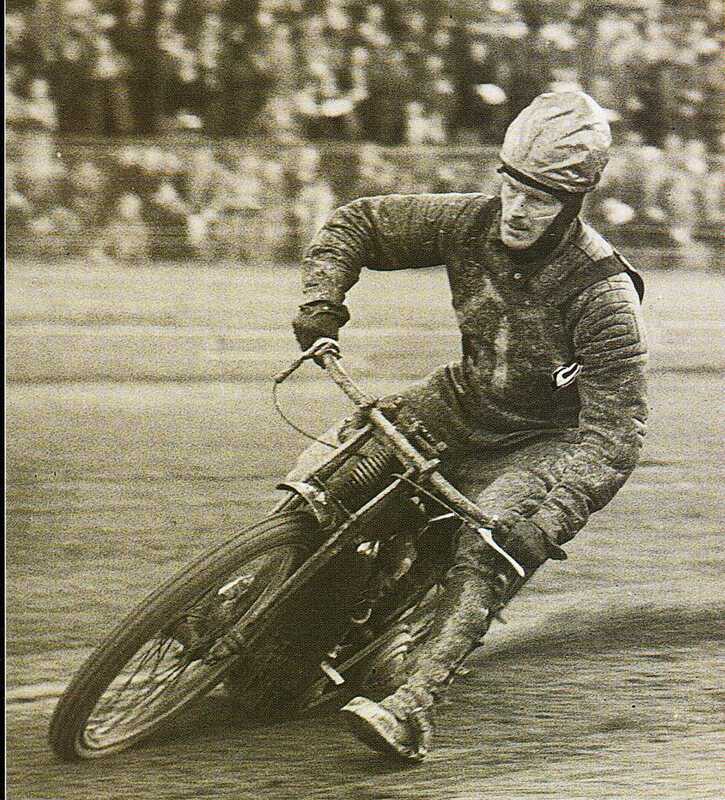 Speedway bikes burn methanol and were not subject to the wartime ban on other forms of motor sport, and the stadiums in which races were held were located in urban areas within walking distance for spectators who had no access to a car. When Eric wrote his reminiscences in 1947 he was far from the end of his racing career but already counted 44 broken bones, included the left collarbone six times and the right four times. 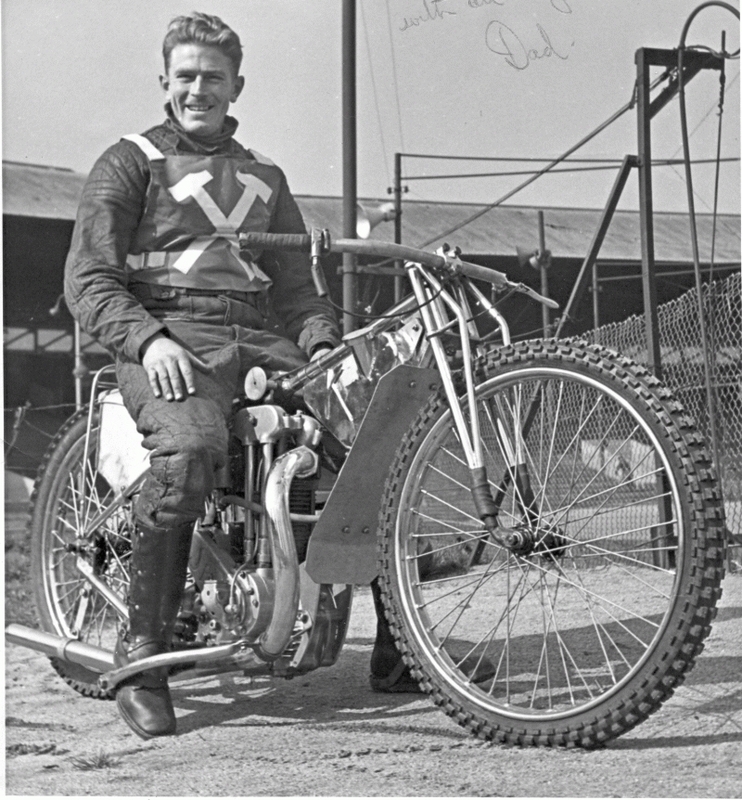 He continued racing until 1952 and was voted one of the seven most popular West Ham riders of all time. He eventually returned to Toronto in 1985 and continued to ride a motorcycle until his death in 1990. 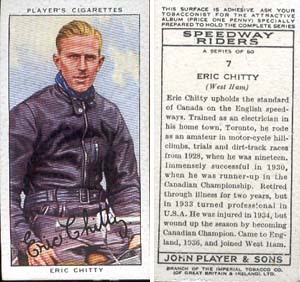 Eric Chitty passed away in 1990.